E & T Fasteners offers a wide range of metric and standard fasteners, designed and manufactured in our North Carolina and California facilities. E & T Fasteners manufactures an extensive line of molded plastic fasteners and machined metal fasteners including nuts, screws, washers, bolts, screw insulators, spacers, clear binding posts, to name a few. One type of nut that E & T Fasteners offers is a full line of glass filled Isoplast™ flange nuts – specifically 40% glass filled Isoplast™ (Glass-filled Polyurethane) flange nuts. 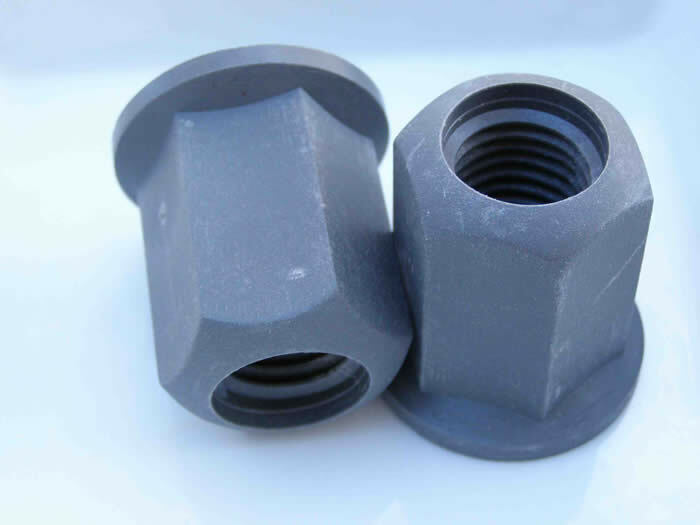 Other characteristics of flange nuts manufactured from Isoplast™ 40% include the outstanding low temperature toughness and dimensional stability of amorphous-type resins combined with the excellent chemical resistance and superior performance of semi-crystalline resins. E & T Fasteners 40% glass filled Isoplast™ flange nuts are ideal for applications requiring strength and stiffness. 3/8-16 to 1-8, in length from 0.75 inches to 1.75 inches (including the flange). The flange portion of our Isoplast™ flange nuts eliminates the need for a separate washer. E & T Fasteners provides 40% glass filled Isoplast™ flange nuts, as well as an extensive line of machined metal fasteners and molded plastic fasteners, for practically every industry, including the aerospace, electronic, medical, electrical, automotive, and food sectors. Don’t see the specific Isoplast™ flange nut you need? The experienced staff at E & T Fasteners can provide you with technical assistance – call or email us with all your particular requirements!